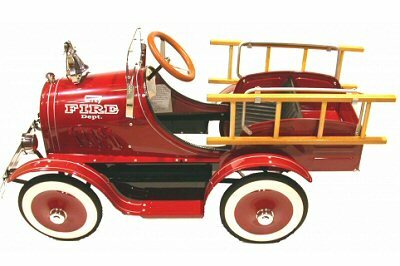 Fire Fighter-themed Comet Pedal Car features a padded seat for comfort, chrome hood, chrome windshield, chrome headlights, chrome grill ornaments, wooden steering wheel and hubcaps. Includes a working bell. Sealed bearing pedal mechanism with 5 position pedal adjustments to suit 3 to 7 yrs of age. All metal - steel construction with solid Duralast rubber tyres. Safety tested & approved. 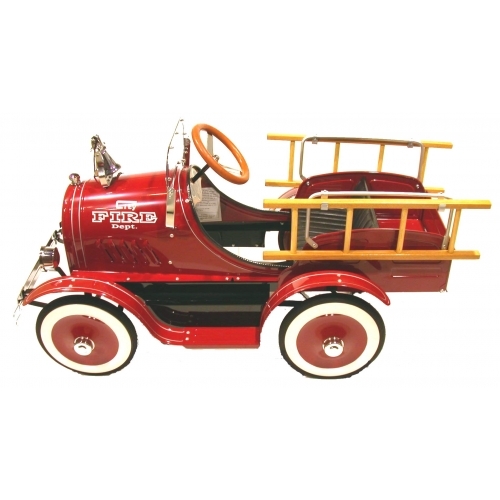 The Deluxe Fire Fighter pedal car is one of the most popular models in our vintage pedal car range. This is a top-of-the-range pedal car with many fine features. An all steel body means that it will stand up to years of active play, and the duralast rubber tires ensure a smooth, comfortable ride. This car features a padded seat and chrome trim. Finished with a beautiful and tough powder coated body, this car will definitely be a crowd pleaser. Each pedal car is built to a very high standard and guaranteed to become a lasting fond childhood memory. These pedal cars are CE European quality standard approved. Accessories for this car include a personalised number plate.